So, this has been something that I worked on in 2010. It was a personal flair for me, something I used solely for myself (and shared with my family), mostly for personal reasons and with some issues I was grasping with after my last anime convention visit in 2009. I had an incomplete project that up to this day never finished. It was a fan crossover thing that was evolving into an audio drama! Finding amateur voice actors and actresses on Youtube, we did lines and it was up to me to put it together. However one character in particular I could never get the lines for. It’s been dormant since. One of the characters in this crossover was Sheena Fujibayashi from Tales of Symphonia. And I had a pretty spiffy voice actress for her. As the project finished and things were sliding, I asked her to do one last project for me; I don’t know where it came from or why I even asked. But I asked her to do some lines for a utility I downloaded off the Internet that would allow me to use on a GPS. In Sheena’s voice. I suppose I had a crush on a fictional character at the time. 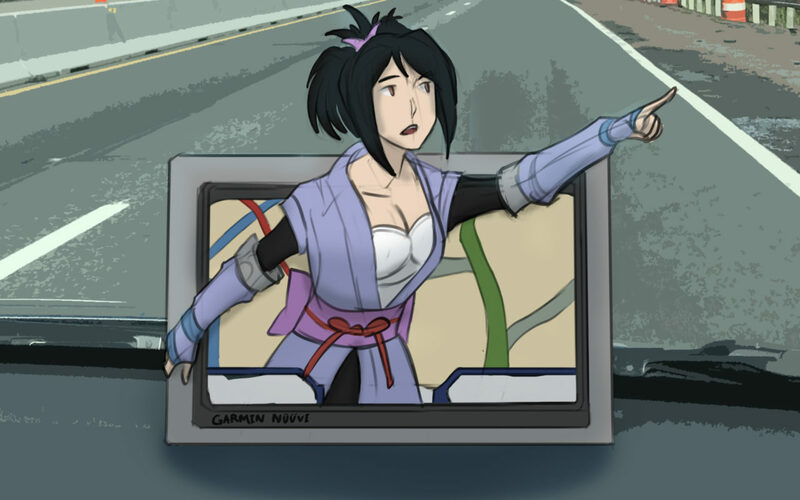 And my creative side figured why not be the ultimate fanboy and have Sheena on your GPS? But whatever the case was, I was successful. And after having been burnt with sharing what I liked in fandom, used it solely for myself. Who could beat Sheena telling you how to navigate down Brooklyn? Or where the next exit was? Or using her head to give you the next best route? I felt ten feet high even though nobody knew. It was just as if Sheena was riding shotgun with a map in her lap, telling you where to go. Now five years later, I want to share that same awesomeness with you. I don’t know what model Garmin this will work, but I have a nuvi 200 series. Its safe to assume anything in the nuvi series should carry it without any issue. This works with Garmin GPS’s only. When that’s finished (this is also on the same site), but go to your options, voices, and you’ll see Sheena Fujibayashi staring right back at you. Select the voice and you’re good to go! When that’s done, if you want to drop by this awesome voice actress and drop her a line, visit her Youtube page here: http://www.youtube.com/user/FreshOrangeBlast She’ll be more than happy to hear from you. EDIT 5-12-2015: I recently got a new Garmin GPS to replace my old one, a 2797 series with the 7″ screen (really nice!). The Sheena voice pack works on it without problems. At this point, its safe to say most Garmin GPS’s will work with the voice pack.